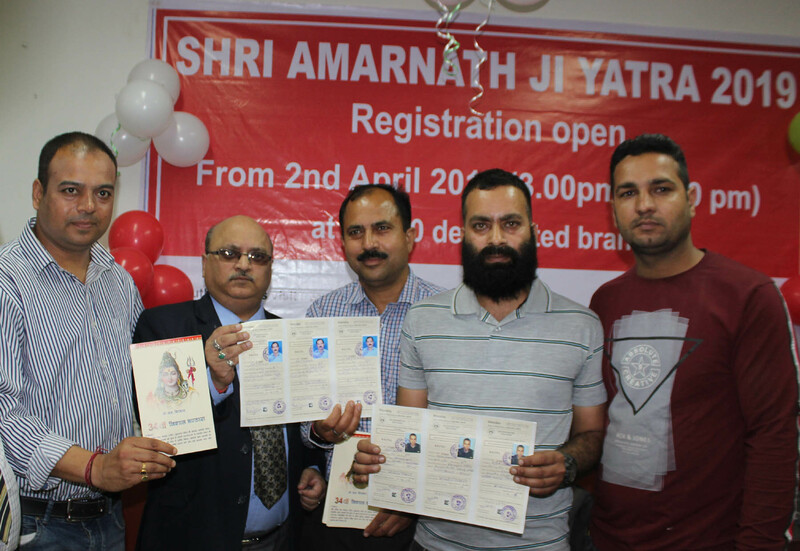 J&K Bank started registration for 46 day long Amarnath Yatra – 2019 to the Himalayan cave shrine today, at 90 designated business units in twenty-one states across the county. The Bank’s Zonal Head Jammu (Central-I) Sudhir Gupta handed over the first Yatra-slip to Ujwal Sharma of Jammu for the Route Baltal at the Bank’s Residency Road counter in Jammu. Shri Amarnath Yatra – 2019 is scheduled to commence on 1st July and will culminate on the 15th of August, 2019. The list of Authorized Doctor/Medical Institution who can issue medical certificates is available on the website www.shriamarnathjishrine.com. However, no one below the age of 13 years or above the age of 75 years and no female with more than six weeks pregnancy shall be registered for Yatra”, he added. The registration facility in J&K is available at 11 Business Units namely Karan Nagar Srinagar, Bakshi Nagar Jammu, Residency Road Jammu, Gandhi Nagar Jammu , Ramban, Doda, Billawer, Udhampur, Rajouri, Poonch and Leh business units of the bank from 3 P.M to 6:00 PM on all the working days. A total of 14720 YPF’s will be registered in J&K by J&K Bank alone.